Path to Scholarships®: What is the Timeline to Request Winning Recommendation Letters? What is the Timeline to Request Winning Recommendation Letters? Almost every scholarship and college requires a recommendation letter. This is at times a stumbling block for many students! 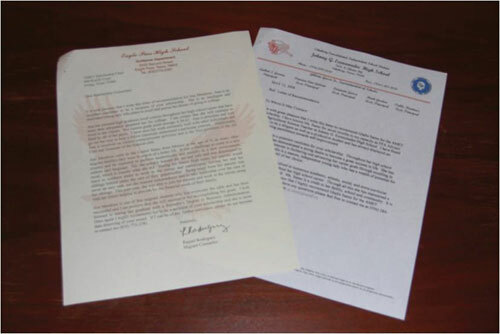 Often students wait until the last minute to request these needed recommendation letters. The best time for students to request recommendation letters is around September. Very few students ask for recommendation letters at this time. Around the holidays, and from January through March, it seems like every student is asking for a recommendation letter for any number of reasons. They ask for them when the teachers and/or professors are the busiest. The turnaround time could be two or three weeks, or never! Meanwhile, the application has a due date and there is not a recommendation letter available. A student should make a request for a recommendation letter at least 2-3 weeks before it is needed because teachers are very busy and need time to write a quality recommendation letter. A student should make a request before the completion of a class, while the teacher or professor still has the student fresh in his mind. Too many times student request recommendation letters from instructors they have had two or three years earlier. 1. The student needs to plan to whom they are going to request a recommendation letter. Make a list with the correct spelling of each person's name. 2. Three types of recommendation letters are needed depending on the college and/or scholarship application: teacher or professor, counselor or advisor, and community leader. 3. No recommendation letter should be from a family member. 4. Request as many letters as possible. 5. Make an appointment to make the request for a recommendation letter. 6. Information documents should be submitted with the request so the person has enough information to write the winning recommendation letter: a cover letter, personal statement, resume, and a thank you note. Scholarships are really nice and good benefits for all the bright and good students. With the help of great dissertation writers uk and good scholarships the good or brilliant students can make their life good and can become the leaders of world.